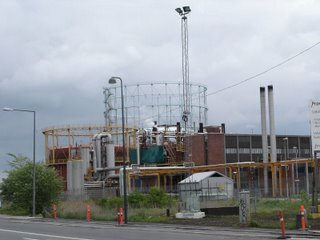 Prøvestenen is the part of the Port of Copenhagen designed for the reception of oil tankers and the depositing of lightly polluted soil. A new deep-water quay is being excavated to receive even bigger oil tankers. There is a relatively large artificial island in the harbour, originally established as a fort and later used as an oil port (history). 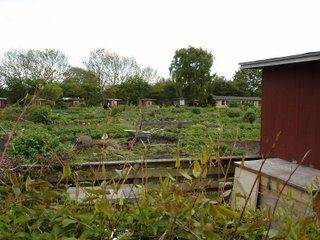 On our last walk we heard about an allotment association just next to it with a communal kitchen garden, which we will probably make a detour to. 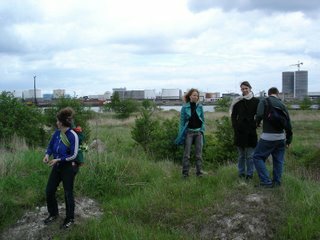 We also hope to receive a visit from a couple of artists from Chicago, who have worked with urban development and urban farming. Date and time: 21 May, 2006, 11 am. The landscape never ceases to surprise us, which also holds true of this walk. It had originally been planned to take us to Prøvestenen. The area was however fenced in with signs saying that taking photographs was forbidden. 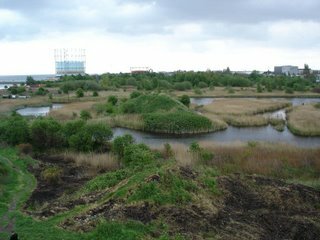 There are major extensions in progress on the island, which once formed part of Copenhagen’s defences but is now used for industry, to receive oil tankers and as a storage site for “lightly polluted earth”. 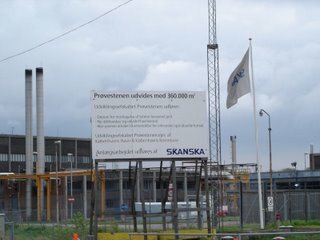 The position of Prøvestenen, so close to the city centre and right next to Amager Strandpark is rather interesting and certainly invites further investigation, perhaps from the water. Instead we walked along the coast towards the town. The fencing in the area is very substantial – also around the allotment association with the communal kitchen garden that we mentioned in our last report. Seen from the outside it was now a fantastic place. People were digging and planting, and everything was fertile and fragrant. The sheds along the waterfront for a sailing club were also extremely active, and there was a general sense of activity and of the landscape being used, something one doesn’t see much of in the city on a Sunday morning. In a wild and untamed area we encountered some caves dug into an undulating terrain. Somebody had clearly invested a fair amount of energy in creating a small fortress. 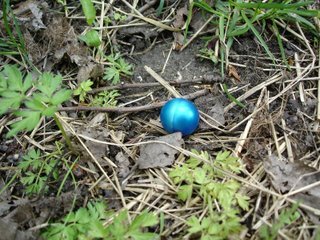 The floor of the woods was strewn with blue bullets with a mother-of-pearl surface that made one think of the excrement from some fantasy animal. From a nearby mound we were regarded through binoculars by men in camouflage clothes. 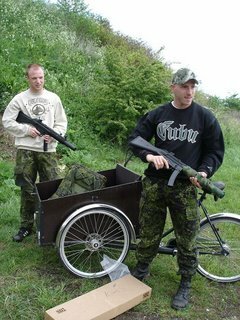 Later we found out that they were looking out for fellow combatants for a softgun battle. The area is extraordinarily beautiful and has masses of birdlife, but the site is said to be one of the most polluted in the country because of the enterprises that were once situated there. It is ironic that the pollution may be one of the only things that can prevent the area from being built up with far too expensive apartments. Daniel Tucker, Emily Forman, Dot Nielsen, Pia Rönicke and Nis Rømer.